FRANZ JOSEF GLACIER, New Zealand (AP) — New Zealand is renowned for its wondrous scenery, and among the country's top tourist attractions are two glaciers that are both stunning and unusual because they snake down from the mountains to a temperate rain forest, making them easy for people to walk up to and view. 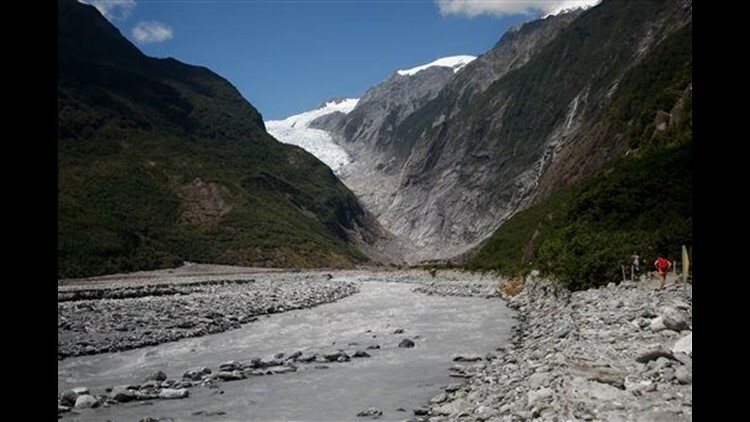 "We know that glaciers around the world, including the Fox and Franz Josef glaciers, are responding to that warmer temperature and they're retreating," she said. Small changes in temperature and snowfall tend to be magnified in the two glaciers and their retreat has been interrupted by advances that can last years, she said. It's also a region which is subject to rapid changes in the weather. At the time of November's helicopter crash — which killed four tourists from Britain and two from Australia, as well as the New Zealand pilot — some observers said the weather and visibility were marginal for safe flying.